St. Peter and St. Paul were very different in background, personality, experience of life and especially in their manner of knowing Christ Jesus. Nevertheless, these two were chosen as people upon which the Church of God was to be built. It is encouraging for us to know that Christ’s call is tailored to each individual. It is a cause for mutual respect. We need to value God’s work in us so that we may be encouraged to give of ourselves more. There is a priority of commitment; to husbands and wives, to children, to the family of the Parish and then in ever increasing circles outwards. Do not forget to pray for your Parish family; our Bishop Peter, your Priest Richard, your Deacon John, and all those who make community possible. Thanks to you all, for all that you do. 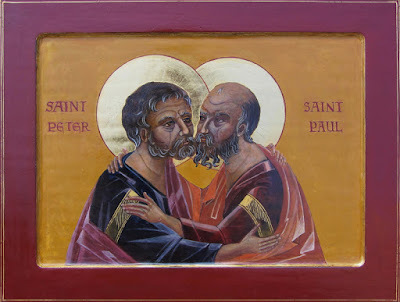 The Icon of Saints Peter & Paul is by Caroline Lees. The artist has kindly allowed us to use the image, so do take the time to look at her website.